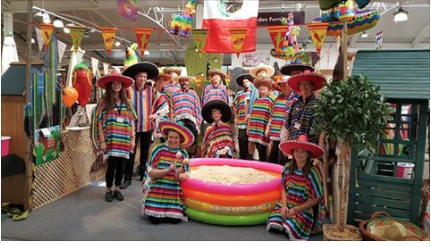 Squires Garden Centre in Long Ditton held a Mexican Fiesta Charity Day at the end of August which has raised £556.76 for Princess Alice Hospice. There was a Mexican selfie station, face painting, lucky dip, charity raffle and a fun trail around the garden centre. Customers also enjoyed Mexican food including Chilli Con Carne and Fajitas. Squire’s employees got into fiesta mood too by donning sombreros and ponchos. Squire’s in Long Ditton have chosen Princess Alice Hospice as their charity of the year, and they will be supporting them through to next July 2018. Princess Alice Hospice is a local charity that provides free compassionate care for people with terminal illnesses and their families.